Something easy but fun to make with the children, madoul dates are really easy to mould so you play around with the ingredients and add some favourite nut butter, seeds or grated vegetables. Nuts and seeds are full of goodness for children so it’s great to get these into their diet where possible. Dried fruit is high in natural sugars so it’s best to limit these…especially for young teeth. Put the madoul dates in a small food processor and blitz until completely chopped. Add half the chopped hazelnuts, the melted chocolate and ground flaxseed, blitz until combined. Use your hand to roll the mixture in the palm of your hand to make small balls. 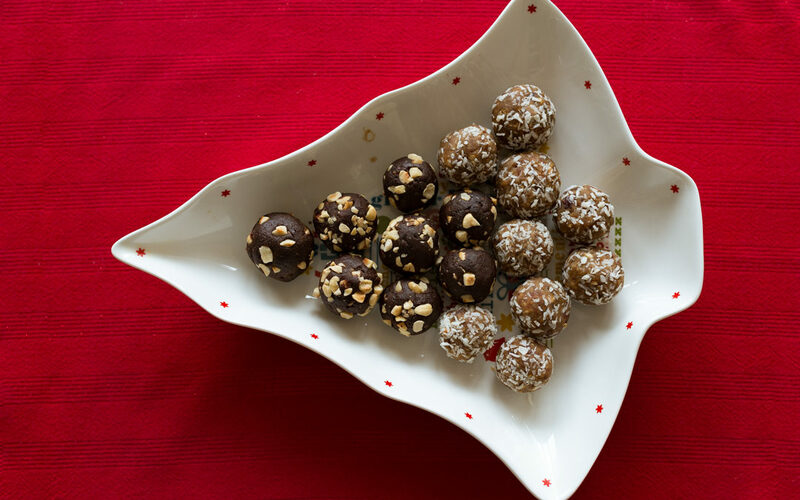 Place the rest of the hazelnut in a bowl and roll the balls round until coated. For the coconut balls replace the hazelnut for desiccated coconut. For nut allergies replace the nuts with chopped pumpkin seeds. Store in a cool dry place for up to 10 days Not suitable for freezing.